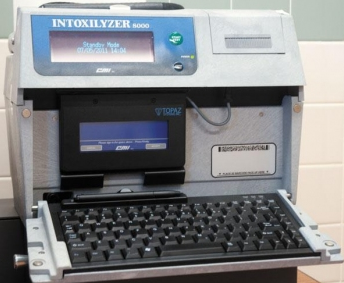 Oregon DUII Part 1 - Potential Benefits of the Breathalyzer - Owens / Pinzelik, P.C. Posted on October 2, 2013 December 29, 2016 by Brook Wood. Filed under: Criminal Law. Tagged: breathalyzer, DUII, oregon, Owens. You’ve just left your friends behind after an enjoyable night and are headed home to the comfort of your own bed. Then that sinking feeling as you see the red and blue flash in your rear-view mirror. You have just been pulled over and, though you may feel fine, you know you’re probably in trouble. Continuing the above scenario, the officer approaches your car and begins to ask you questions. Do you know why I stopped you? Have you been drinking this evening? How much have you had to drink? When was your last drink? It all happened so fast and you don’t even remember what you said. What you do know is that at the end of the conversation the officer indicated he was arresting you for DUII. You are cuffed and in the back of a squad car on your way to the station. When you arrive you are asked to voluntarily submit to breath analysis to determine your blood alcohol content (BAC). Many people instinctively refuse to ‘blow,’ thinking that if the cops can’t determine their BAC they may have a better chance of getting out of this. There are situations in which not submitting to the test might be beneficial, given a person’s unique circumstances. What many people don’t realize, however, is that there are potential benefits to submitting to the Breathalyzer. Implied Consent Suspension – Under ORS 813.100 and 813.420, refusal to submit to the test will automatically result in suspension of your license for a period of from one to three years. Compare this to the automatic suspension that results from a ‘failed’ test of only 90 days to one year. Low BAC – Under ORS 813.010 a person is guilty of DUII if the results of breath (or blood, again a different topic) analysis indicate that you were operating a motor vehicle with a BAC of 0.08% or higher. If the Breathalyzer demonstrates that your BAC is below 0.08% you might not be charged with DUII. Another future topic will discuss how you may still be charged with DUII even if your BAC is below this limit. High BAC – Under ORS 813.010(6)(d) a person convicted of DUII with a BAC of 0.15% or higher must pay an enhanced fine. This, obviously, is not a benefit. However, a high BAC can be indicative of a ‘problem condition involving alcohol’ – legalspeak for alcoholism. Oregon laws and courts recognize that alcoholism is a problem that may be beyond a person’s control alone and the system allows for people with genuine difficulty, who genuinely wish to receive treatment, to be provided both some measure of leniency and assistance in receiving much-needed treatment. Only a competent, licensed Oregon attorney can explain your options under these laws to you if you have refused to submit to breath analysis or have submitted and still face criminal prosecution. To be contacted by an attorney at Owens / Pinzelik, P.C., click here. For informational purposes only and not to be relied upon as legal advice.